Have you ever wanted to create your own font but never had the creative resource to do so? well fret no more- check out Font Shop International’ new website Fontstruct.com, a free online community and resource for creating, sharing, and downloading custom made fonts. This online editor sports an easy to use interface and intuitive tools that allow you to create everything from dingbats to old english lettering, etc. FontStruct is a free font-building tool brought to you by the world�s leading retailer of digital type, FontShop. FontStruct lets you quickly and easily create fonts constructed out of geometrical shapes, which are arranged in a grid pattern, like tiles or bricks. Once you’re done building, FontStruct generates high-quality TrueType fonts, ready to use in any Mac or Windows application. For more great font/type resources check out our sponsors above- thanks. 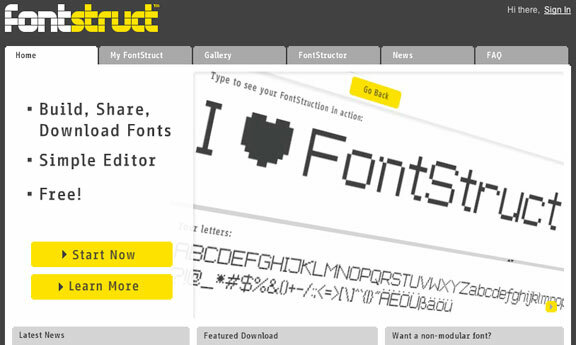 Click here to go to the Fontstruct Website. Fontstruct looks really cool! Thanks so much for turning your readers on to this resource.